Once upon a time in a forest of rotting crabapple trees and quaking aspens that were dying of Parkinson's disease there lived a nasty pedant-magician named Snodrog. 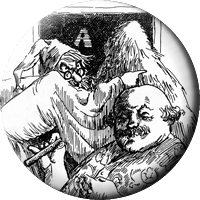 This Snodrog, whose house is made of old bed slats, spends his days posing logical problems to victimize unfortunate passersby.... Fortunately for everyone, a kindly old gentleman, Sir Bertram Crabtree-Gore, enlists a Shuffly to foil the nefarious Snodrog. A monstrous duel ensues. Someone is turned into a very unattractive ticker tape machine. Other happenings follow, too humorous to mention here. Suddenly the air got colder, and a black cloud appeared - the black cloud that you saw before, since Snodrog was, at bottom, a cheapskate. Only this time the cloud looked like an overdone hamburger, and it hovered low over the Shuffly's head. A faint whirling began, and it roe till the noise was like that of a badly adjusted metal lathe. From the cloud roared a blizzard of Irrelevant Facts, and it swirled around the inert creature till he looked like a spiny snowball. Then Snodrog's devious machine spread under the Shuffly's unsuspecting feet a glistening patina of Generalizations, and the immobilized hulk slid the hill into the valley below, ricocheting off trees with a sound like wet sponges being slapped on kitchen sinks. Who is Georg Philipp Telemann?